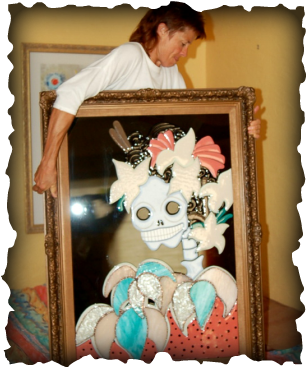 _ I am an artist who paints with glass - fused glass compositions mounted precisely in frames and ready for hanging. My most recent series is a lively celebration of the dearly departed, but they are far from lifeless. The dynamic spirits featured conspicuously within these works will charm you with their individuality and enthusiasm. It is there that you can see my Steampunk Jewelry, Eclectic Night Lights & other Wild Imaginings!